A great amateur astronomy star party/convention is held each August at the dark sky preserve in the Gordon's Park Recreation Area near Tekumah on Manitoulin Island. On good nights, (like the Thursday night before the start of this year's conference) stars are visible down to magnitude 7 (Very, very dark site - excellent for hunting down dim star clusters and galaxies) !! 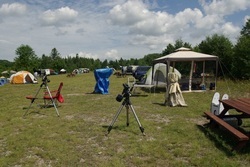 This year, about 50-60 campers set up in the dark sky preserve while another 20-30 visitors participated while staying in other parts of the campground. Thursday night, just before the convention, the skies were clear and dark all night with the occasional wispy cloud passing overhead. Seeing was relatively good, but transparency came and went all night. Overall, in comparing it to other nights spent here, I'd give the sky conditions a rating of 7/10. Many objects (such as open clusters, planetary nebulae, galaxies, emission and reflection nebulae, and globular clusters) were observed until about 4 AM when the last of the dedicated observers gave in to their need for sleep. Highlights of the night throught the 28" telescope included incredible views of wisps and swirls in the dark nebulosity dividing up the trifid nebula in Sagittarius and the 3-D appearance of segements of the Veil nebula (a supernova remnant) in Cygnus. The fine lacy appearance of wisps within the "Broomstick" section was breathtaking. 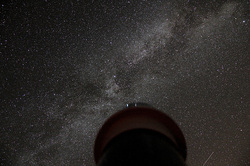 Friday night was mostly clouded out until about 3 AM when skies cleared - then excellent viewing conditions until dawn. Aurora Borealis (northern lights) appeared at sunset in the north and northeast and grew in intensity until about 1:30 AM, then diminished. Greenish yellow bands appeared low to the horizon first, then steadily grew both in height and breadth until at their peak they stretched from the West to the East-North East. Faint waves of greenish-grey light flashed rapidly up from these bands, growing like breaking waves from a rate of 1 every two or three seconds to several per second. Eventually they appeared to move from about 25 degrees above the horizon to directly overhead and past the zenith. Spikes grew and faded reapidly from the bands and formed the brightest parts of curtains or aurorae that were partially hidden from view behind high stratus-type clouds.Some people reported seeing purple colours in the curtains and spikes. Saturday night was clouded out until about midnight. Then, the cloud cover slowly started breaking up and again observing became much easier after about 2:30 - 3:00 AM. Some high and mid-level clouds were still present at dawn. With the 28" Leviathan Telescope, observers were able to view many planetary nebulae (including the Blinking Planetary in Cygnus, the Saturn Nebula, the Owl (M97), NGC 6781 and the Little Dumbell (M76)), globular clusters (M54, 55, 22, 13, 92, 15, 89, 4), open clusters (the ET Cluster, Double Cluster, The White Rose, M11 and others) and a few interesting galaxies (M33, M51, 101, 108, NGC 2403, NGC 6946, NGC 7479, NGC 7331 and Stephan's Quintet). Emission/Reflection nebulae seen included the Veil Nebula (all parts!) the Lagoon, Trifid, Swan and Eagle Nebulae and several others. Jupiter and the Galilean moons were the last viewed objects each night as they would ruin dark-adapted eyes because of there brightness when view through the 28"scope. See the gallery of images to get some idea of what many of these objects look like...remember photos usually show a lot more detail and colour than visual observations do. With a big scope like the Leviathan, however, some of the views come pretty close! During the day on Saturday and Sunday there were a number of speakers, including yours truly, who presented slide shows, lectures and workshops on topics ranging from how to put together, use and maintain your telescope (Ray Khan - Khan Scope Center) to Exploring interesting stars in the night sky and examining their types (Greg Emery - Hamilton RASC), to discovering bright objects beyond those in the Messier Catalogue, to learning about the search for extrasolar planets and what we know about them so far (Steve Pellarin - Windsor RASC). A slide show was presented on Saturday night by Jeff Deans of astrophotos both he and Aaron Top have collected over the past few months at the Dark Sky Preserve. This came after a delicious pot luck dinner put on by our convention hosts Rita and Terry Gordon. Laser guided tours of the night sky led by John Albers and myself took place on both Friday and Saturday nights at sunset, and despite poor conditions, were well attended. The annual fossil walking tour also was enjoyed by some of the campers on Sunday afternoon under very warm conditions. Overall, the weekend was very enjoyable, as the hosts and their staff did their best to make all campers comfortable. Attendees were warm and welcoming to all who dropped by for a chat. 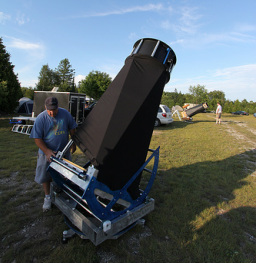 Many interesting telescopes and astro equipment were also on display. Normand Fullum, from Montreal, and a few colleagues had some of his beautifully hand-crafted wooden telescopes on display as well as having a number of large dobsonian-type telescopes ready for nighttime viewing. Some campers arrived ready to try out newly purchased telescopes, while others came with binoculars or just their own eyes, ready to soak in the billions of stars visible within the summer Milky Way. The 28" scope ("Leviathan") was ready to go all weekend and I enjoyed sharing views with many visitors who dropped by to see whatever was in the eyepiece. I look forward to coming back to this great observing event next year (or perhaps even sooner) and reconnecting with friends both new and old to share our love for exploring the universe from such a great location. Thanks to all who made it such a fun and educational experience!